Scene #1.......................Last Sept. 28th I rescued a heavily matted, docile LHASA APSO of about 2-3 years of age. I brought this scruffy, little angel home to be a loving, schmoozey companion to my invalid Mom (age 89) and me. I named her WINNIE after 4 days of observing her soft, loving POOH-BEAR demeanor. After 6 weeks of doting affection and inconsistent boundary setting, WINNIE-THE-SHREW appeared and took over the house as a self-appointed "ALPHA" leader. I was desperate. An expected joy had turned into a live-in TERRORIST. Woe was me. Growling, snapping, biting, chasing, chewing and total disregard for my commands or authority was zapping my energy and any hope of a turn-around. Scene #2......................Enter Vladae Roytapel. I spotted his business card on your clinic counter. Your staff freely offered that he was excellent. . . .and clients had raved of complete turn-around results. Vladae first came for a 2-hour consultation. I was fascinated by his assessment techniques, diagnosis and prognosis statements for Winnie's problems. She was one of the worst aggression problems he had seen in a smaller dog. But, like a rainbow, Vladae brought hope to the situation. And with the skill of an artist he showed me the impact of each small brush stroke to the new portrait we were both creating in Winnie. The results have been AMAZING. Winnie has returned to her proper place in our household as a well disciplined and enjoyable, treasured pet. She is so much happier in this role, and so AM I. 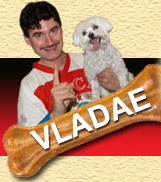 EPILOGUE.....................I highly recommend Vladae as a trainer of dogs and especially their owners. He can quickly and accurately evaluate the problem areas. He generously shares of his broad knowledge, expertise and insights on animal behavior and our responses to them. Vladae is tough, yet affirming. His positive energy and persona, relentless determination, and love of his work shine through in every lesson. "MO-TI-VAAA-TION" is Vladae's middle name from my perspective. . .and excellent results are what you can expect if you follow his lead to becoming a good owner of a great dog. Thank you so much for recommending Vladae to me. Please feel free to share this letter to those who inquire about his services.